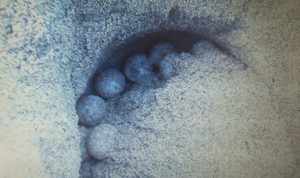 Sea Turtle Eggs Partially Buried on the Beach in Sunny Isles Beach. Collecting data on these stranded sea turtles, even those which are deceased, is vital in helping to understand this species as they spend most of their lives at sea and this can make studying them difficult. All strandings need to be responded to ASAP and information is reported to the state within 48 hours of the stranding. Teal Kawana – 954-732-6836 with MDCSTCP directly.